This is a bit of a backpost, but I wanted to make sure it was up here! I already wrote an entry for the top left outfit here! This past winter, I really wanted to explore a very dark, mature palette. 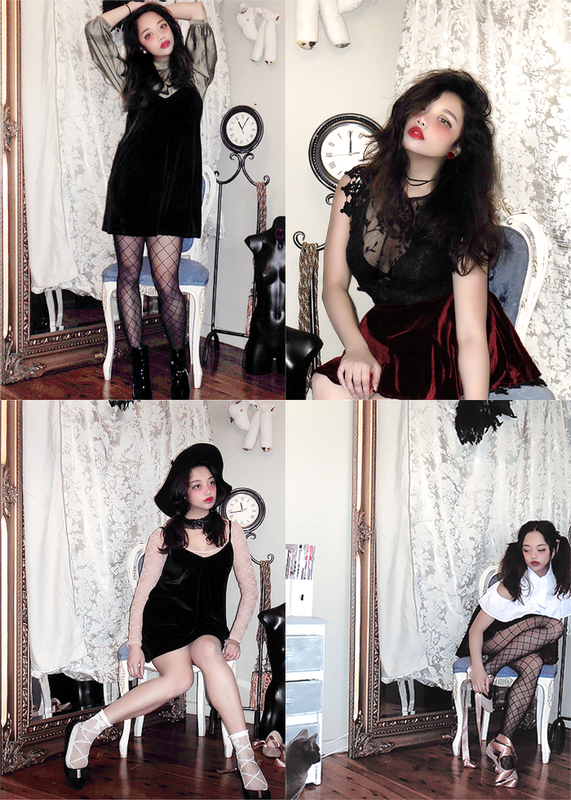 I loved mixing textures (lace, velvet, embellishments), and keeping a sort of undone, half-messy look (I woke up like this and worshipped the dark goddess of velvet and lace). I especially enjoyed the fishnet stockings last winter - they were surprisingly very warm and were able to add that extra hit of maturity! I kept a simple eye and bold red lip, which I felt let the outfits take centre stage. My inspirations for these outfits were pretty much all of LARME 24, but especially the darker looks, in both beauty and makeup! I think it's very interesting that LARME 24 included some trends that in the West, were a little bit outdated, such as leather dresses and felt hats. But I feel they did it successfully, and it was a great reason to dust off some old items (and not have them go to waste!) I haven't really seen anybody wearing felt hats and leather for about a year or two now, so kudos to LARME for bringing them back! Of the above inspirations, I drew from the hat Chipopo was wearing as well as Monaca's whole outfit & silhouette. I ultimately decided to go with a satin khaki instead of a pink turtleneck, however, as I just really wanted to use it (LOL), and I think it gives off a bit of a more mature but grungy vibe. PS: your blog is awesome and such an inspiration to me! Thank you so so much! ♥ ♥ ♥ Yes I really love the darker side as well! And it's so wearable when you sort of just want to look less "sweet" (though I also love the sweet looks!). It doesn't get very cold here in winter so I'm sorry if these aren't very helpful! I did have to wear a coat on top while going out though!